Self-compassion: we give to others but what about giving to oneself? Often, we think we are alone in our suffering: I hear it from patients’ weekly comments such as “am I the only you have seen with this?” We know issues such as chronic pain, abuse, divorce, love and family crises often put people in the “I am alone” or “I am the only one” scenario. I preach often for self-care, but what about self-love? Should we ignore pain? Maybe allowing ourselves to acknowledge the time as a difficult time. And then following through with how can I make it better? How can I comfort myself? We try to push away pain: perhaps we stop judging ourselves for having such pain. By the way, when I mention the “pain”, I am referring to all types of pains not just physical one. For example, the pain a parent feels when they think they’re failing their children or a pain of a break up. What are some benefits to self-compassion? To name a few: self-worth, motivation, happiness, body image and reduce mental health issues. How can we find self-compassion? Of course, mindfulness is on top of the list. Expert Kristin Neff, PhD also puts self-kindness and common humanity on this list. 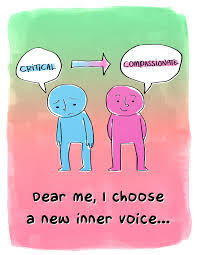 In self kindness we start working on our inner critic: you know that voice that tells you, you didn’t do good enough. Common humanity describes that failure and suffering are parts of being us. Let’s address self-kindness. I believe many of us deal with negative self-talk. Recently during a health coaching retreat, the attendees were asked to read and address their own inner critic. As I was contemplating my own answer, I fell into the I am the only one scenario. As I began listening to other responses, which included other PTs, MDs, teachers, doulas, nutritionists and such, the light switch turned on. Most of us give so much and encourage others, yet we are so harsh on ourselves. It may take you realizing that you are lacking kindness toward yourself. For example, name calling to me is so disturbing. I “allowed” it to happen in my own life for a few years. I had to realize that I was calling myself some of those names and I was identifying my failures at home and work often. If I was talking to myself so critically, it was not surprising someone else would too. Start practicing compassionate talk with yourself. For example: “I may be going through a rough patch. Ups and downs are a part of life” or “I accept myself as I am” or “I have much kindness to give.” You can also practice meditation geared towards self-compassion. Research has shown those that have self-compassion tend to have less threat of pain and less feeling of helplessness. Studies have shown mindful meditation improving quality of life. We can use meditation to “accept” pain vs suppressing or getting angry that we have pain. We start to realize some things are out of our control and we need to embrace ourselves with kindness at that time. Studies have also shown a link to being “warm and kind” to oneself with lessened depression symptoms while dealing with chronic pain. We often see those that practice self-compassion become more active and participate in more activity. Several positive outcomes occur from this as we not only become more kind, we also get stronger and mood improves! There are clear benefits to starting a practice of self-compassion. Our inner critic deserves some positive and loving talk. Remember, you are not alone. And it is ok to be imperfect. If you are having trouble starting this practice, find a therapist or coach to help you build this new strength!